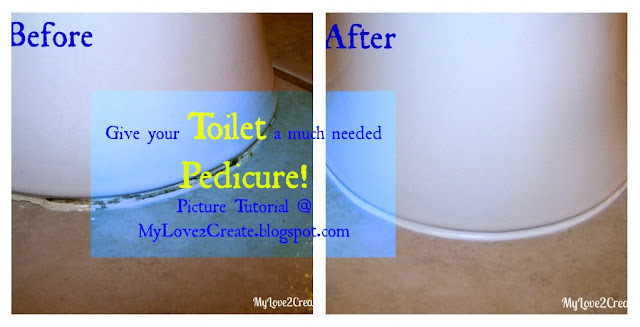 I took action, and decided to give my two upstairs toilets a much needed pedicure! There may be a fancy tool to do this but my screw driver worked great! It is very important you make sure all the moisture is dried out, if you are in a hurry bust out the hair dryer for a quick fix. Any other brand of bath caulk will work too. I like this one because it was easier to hold than my huge caulking gun. Cut off the tip at an angle. If you mess up, try wetting your finger and re-sliding. 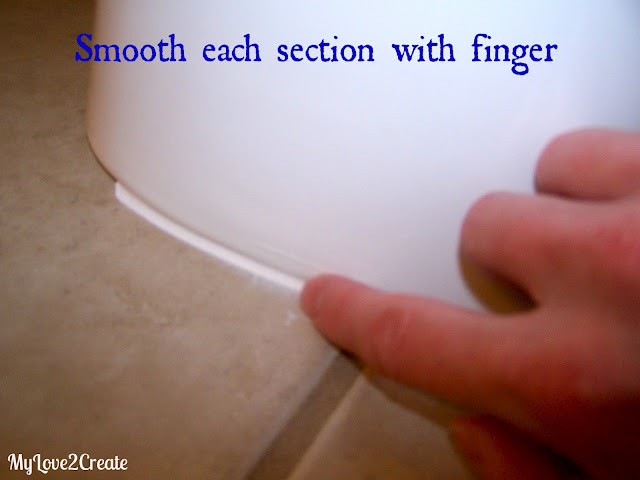 Add more caulk if needed, and slide with finger until smooth. Make sure there are no holes or gaps, and especially check the back of the toilet, you will have to get real up close and personal with the tile and toilet (that's why you clean first!). It is a good idea to have a wet rag or paper towel to wipe off the excess caulk from your finger. 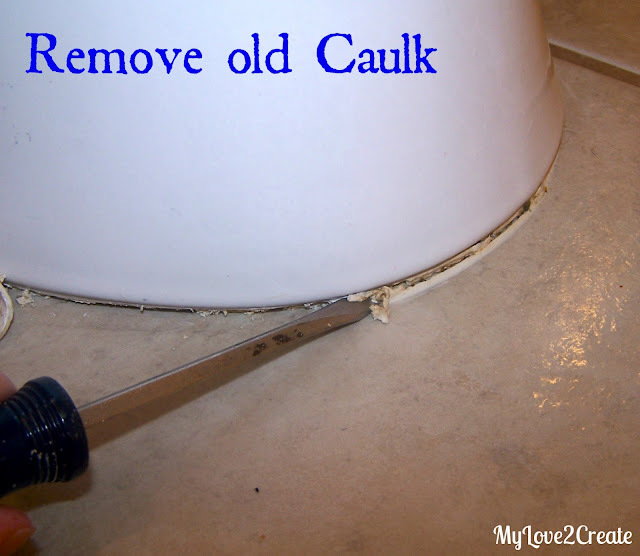 Rinse your sponge often so you don't wipe caulk back onto the floor and toilet. Now you have a nice pretty toilet! 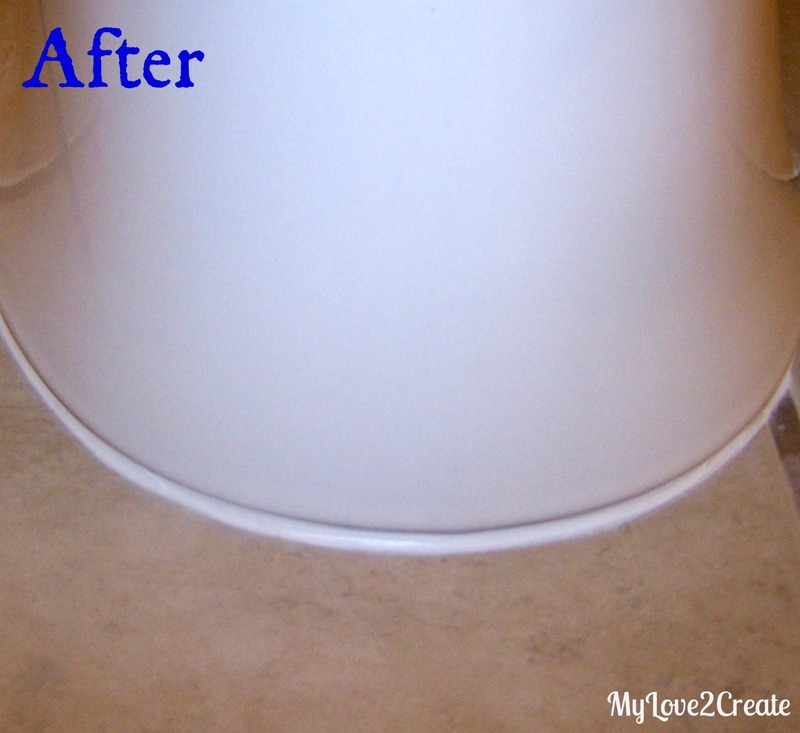 Ahhh, I can feel completely happy now when I clean my toilets, they look SO much better! This was so fast and easy, I did two toilets in less than one hour, and most of that hour was drying time! 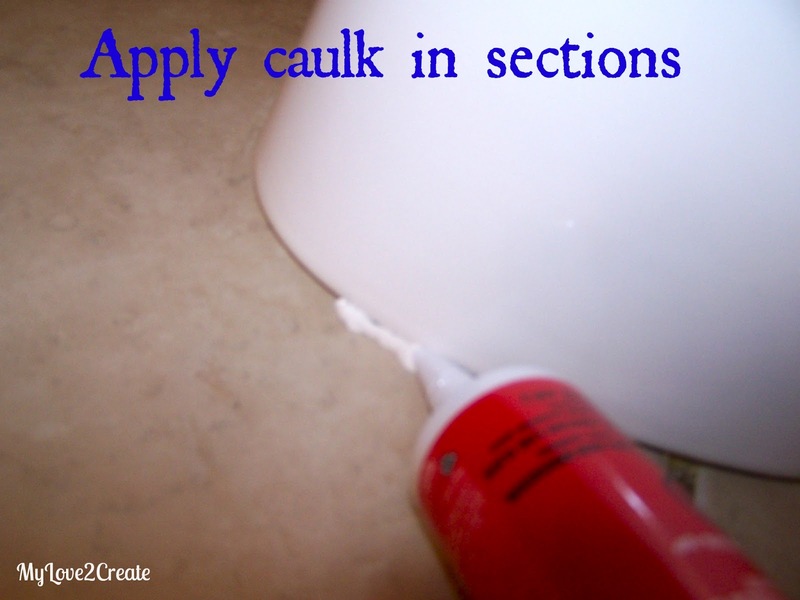 If you have ugly caulk I hope I have inspired you to action! such a simple yet very impactful project. Pinned it! Great tutorial. And so funny to call it a "pedicure". My toliet needs one right now, and so do my feet (minus the caulk) lol. I like this idea so much that I pinned it and shared the pin on my Facebook Page. Please stop by OneCreativeMommy.com and grab a featured button. Thanks for linking up to One Creative Weekend. The new party is open. I hope to you’ll be back. It does look better, but you really shouldn't caulk around the base of your toilet. You want the water to come out from beneath if there happens to be a leak. If you don't know it's leaking you'll just end up with a rotten floor. If you see a leak, you know something needs to be fixed. Thank you for you comment and your concern. It is true you could have a leak and not know. It actually happened to me last year. I asked the plumber about it and he said it was not necessary to caulk around the bottom of the toilet, HOWEVER there are some important things to consider. I caulk around my toilets because I have 6 children, 5 of which are boys. Try as they may they do not always "aim well". 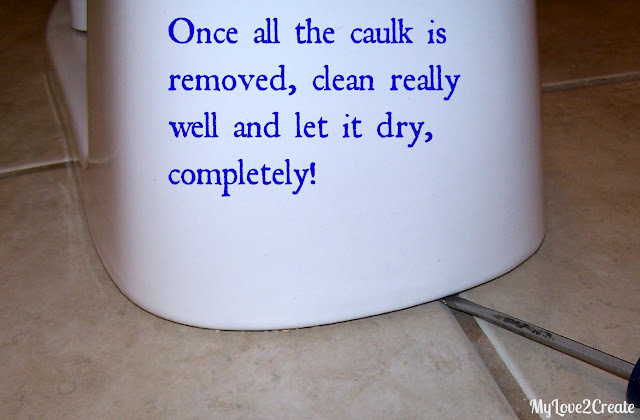 When I consulted with the plumber about this he recommended that I DO caulk around my toilets. The urine that "missed" would find it's way under and soak into the wood and cause problems of it's own... Urine SMELL! I personally did not want to go there! I am happy to do my own annual or semi-annual caulking and check for toilet leaks... I hope you can understand for some of us it is more of a necessity. Toilets get used who knows how many times a day, but the chances of a leak are well....a lot less. Thanks so much for stopping by! I totally get it with 4 guys in my househould. New calking is gonna happen tomorrow. I also put a large piece of plexiglass against the wall beside the toilets to avoid wall spray/odor - easy to wash off and no damage to the walls. I chose to caulk around the front and sides of the toilet. Leaving the backside untouched so if there ever is a leak you'll notice it sooner rather then later. That's a great idea! Sounds like the best of both worlds! That's really amazing! It made your toilet look very clean, and its also a wise thing to do to keep the moist from getting in to the wood, which might lead to rotting or having a stinky bathroom scent. And of course, it would also keep your toilet on hold. 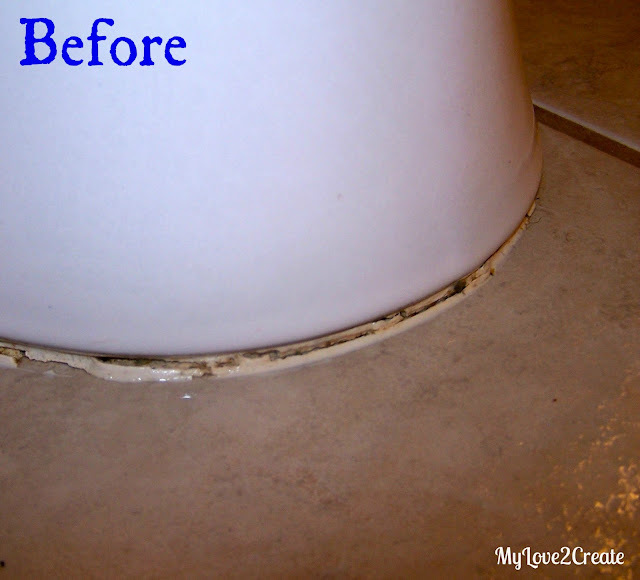 It’s amazing how a simple caulking can make a huge difference on how your toilet would look. It looks so clean and bright now! Anyway, I agree with Ziming. You can leave the area behind un-caulked, since it won’t be noticeable. Thanks for sharing! The before and after definitely show how effective your toilet "pedicure" was. Very clean looking and simple process. I can understand what an eye sore it would be to always keep a clean bathroom only to have the toilet ruining the whole thing. Good work! Its a nice trick! Thanks for sharing. 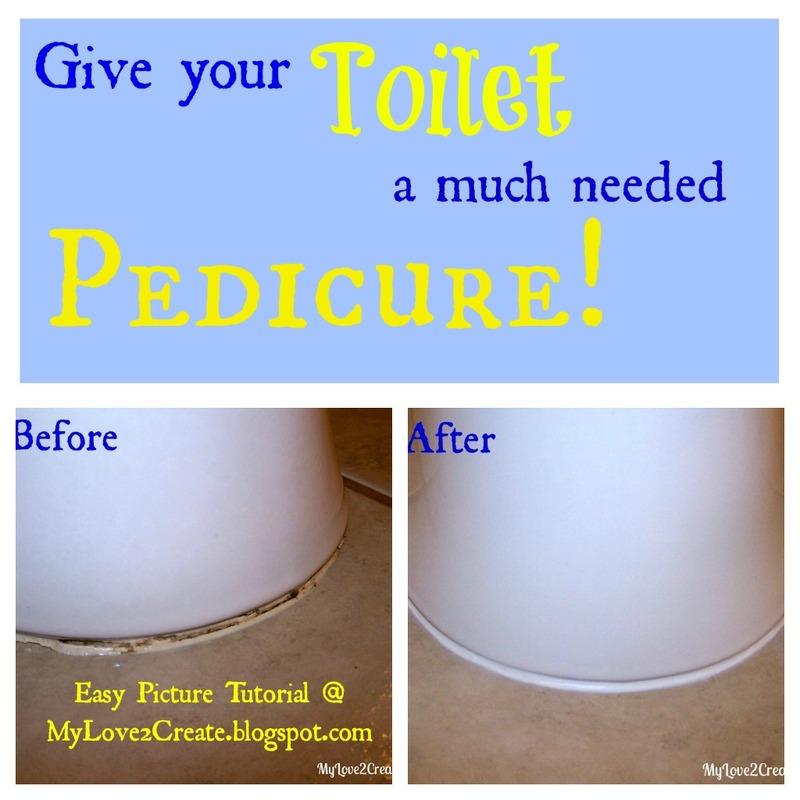 Great tip, looks much better afterwards!